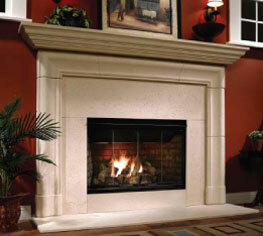 This 42" open-hearth gas fireplace gets homeowners as close as possible to the experience of a woodburning fire. It also offers a number of benefits that make it a strong all-around choice. The Reveal can burn with the optional doors open or closed, giving homeowners greater control over their fireplace experience. The six-log set is realistically detailed and assembles easily. The three-tiered burner provides full generous flames using 43,000 BTU's per hour. The radiant design and multi-colored stone refractory deliver the best and most realistic look available. All components are UL, AGA, CGA or CSA safety certified. Limited Lifetime Warranty.